Night had fallen by the time I arrived in Wasselonne, a small village in France’s Alsace region bordering Germany. 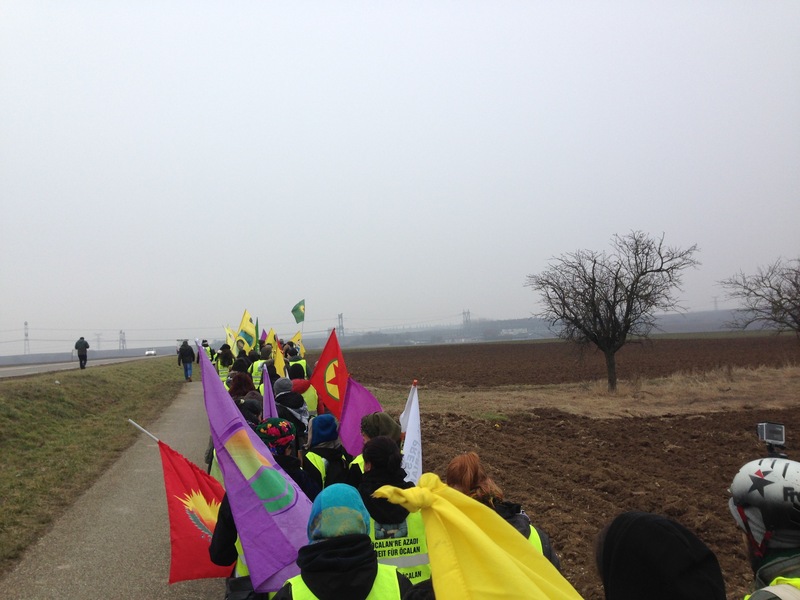 I came to join 80 international solidarity activists engaged in the “Long March for Kurdistan and Öcalan”. 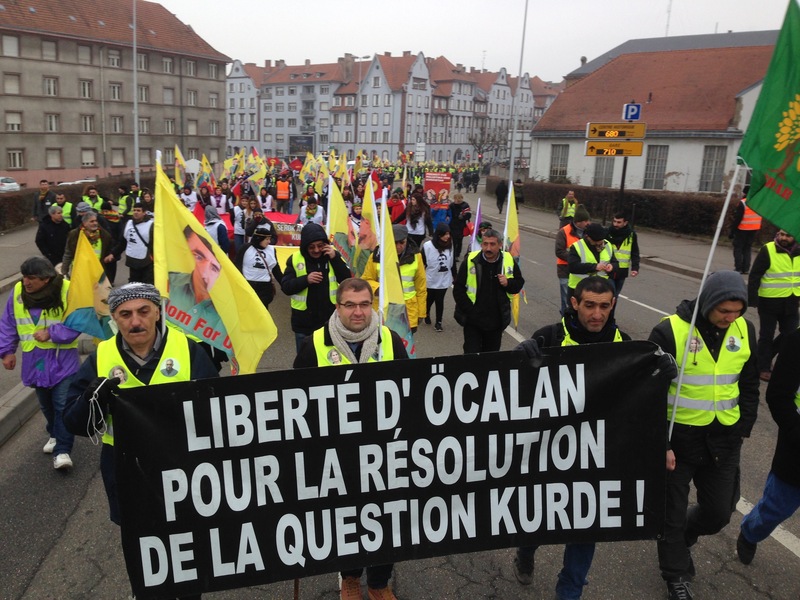 The marchers demanded that Turkey free Abdullah Öcalan, a major Kurdish resistance leader, from his now 18-year imprisonment, and they called for a political solution to the ongoing conflict between Turkey and Kurds. The march began in Luxembourg on February 1st and would conclude in Strasbourg 10 days later, followed by a rally. Participants came from across Europe, from Germany, France, Spain, Catalonia, Portugal, Switzerland, and so on. At least one participant came from Argentina. A sizeable contingent of marchers identified as anarchist and antifascists. I’m a citizen of the United States, though I now live in the UK where I work as a university lecturer. On the march I represented my local solidarity group, “Brighton Kurdistan Solidarity”, and the London-based “Peace in Kurdistan”. Due to my teaching commitments I was only able to join the marchers late in their progress on the evening of their ninth day on the road. When I arrived the marchers were in high spirits, sheltered for the night in a community centre. Kurdish music filled the centre’s main hall. Well over a dozen participants chanted and danced in a rhythmically expanding and contracting semi-circle revolving around the large floor. Though gratified, I was somewhat surprised by the joyous energy filling the room. Besides the exhausting physical demands of marching over 250km in nine days, Turkish ultra-nationalists, violently opposed to Kurdish self-determination, had stalked and attacked the march for several days. While I enjoyed a dinner of bread and cheese the ultra-nationalists attempted another attack. Many of the young Kurds and a few of the internationals rushed toward the hall’s main entrance and out into the darkened grounds. Following them to the edge of the main doorway, I saw heavily-armoured police mobilizing in the parking lot. Older Kurdish men waved their hands, calling for everyone to come back inside. The provocateurs seemed to retreat back into the shadows and eventually the Kurds and internationals trickled back into the hall. This scene repeated itself a couple of more times within the hour. “These Turkish Nationalist fascists have been doing this every night”, someone casually mentioned to me. “They come by and make the hand sign of the Grey Wolves”, a Spanish marcher informed me a bit later. Eventually the French police dosed a group of Kurds and Turks with pepper spray and abruptly brought the conflict to an end. Ostensibly, the police were on hand to protect the marchers but, practically, they protected the fascists. This night the Kurds had the numbers and were ready to settle things after being harassed for several days. “Many of these guys have lost family to fascists”, a young German marcher explained as we settled down for the night. As I drifted off to sleep I reflected on the evening’s events and what had brought me and about 80 other international solidarity activists on this journey. The scene I witnessed was simply an extension of a wider struggle currently raging in the Middle East and across Europe. Kurds comprise the Middle East’s third largest ethnic group, after Arabs and Turks respectively (Knapp et al. 2016). The geographic contours of Kurdistan roughly follow the arch of the Taurus-Zagros mountain ranges to the north of the Mesopotamian plains. Today, as a consequence of the arbitrary borders drawn in the partition of the Ottoman Empire after World War I, Kurdistan exists in a state of geographic superposition overlapping the borders of four states: Turkey, Iraq, Syria, and Iran. At different times and with different intensities these states have adopted polices of forced assimilation and outright annihilation toward Kurds. The Republic of Turkey, for instance, declared in its 1924 constitution that any citizen of the Turkish state was by definition Turkish. Kurdishness was assigned a status of non-existence. If Kurds were to participate in civic life it would require the explicit denial of their identity. The real presence of the Kurds, however, contradicted their official absence. The category of “Mountain Turk” was created and imposed to square this particular circle (Özcan 2006). Through a strange dialectical irony this Turkish nationalist disavowal of Kurdishness helped generate the very thing it denied: Kurdish national consciousness. In 1978 Abdullah Öcalan and a small cadre of militants founded the Kurdistan Worker’s Party (PKK). Öcalan (2016: 9) explains that the “PKK’s struggle until now essentially aimed at making the Kurdish question visible. The denial of Kurdish reality during the time of its formation naturally brought the question of existence on the agenda”. Since 1984 the PKK was engaged in an on-again/off-again war with the Turkish state. By the late 1990s, however, the Marxist-Leninist model of national liberation that had guided the movement since its inception was no longer viable. Through a process of vigorous self-critique, Öcalan and the PKK initiated a search for a new vision. After his capture and imprisonment in 1999 Öcalan continued to explore new emancipatory models. He read Adorno, Foucault, and Wallerstein, among others. However, his discovery of Murray Bookchin’s (1995, 2005) social ecology and libertarian municipalism was a breakthrough. From these ideas and his own considerable experience Öcalan (2011: 21) developed the theory of democratic confederalism, “a non-state political administration or a democracy without a state”. This is the ideological source of the extraordinary social transformations occurring in Northern Syria today; Kurds call this region Rojava, or western Kurdistan. As we walked along our route a light snow fell, flakes quickly dissolving on the brown loamy earth of the vast ploughed fields of the Alsatian countryside. We had plenty of time to talk as we walked the last 26km to Strasbourg. 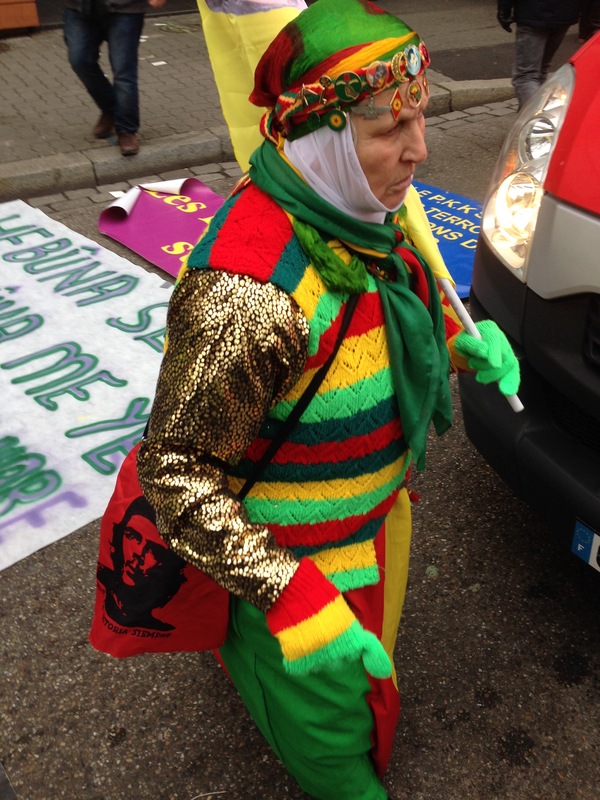 Many of the march’s participants were inspired by Rojava’s radical project of bottom-up governance characterized by plurinational communalist democracy, women’s liberation, and ecological sensitivity. I learned that, like myself, many of the marchers first became aware of Rojava’s revolutionary project when the self-proclaimed Islamic State (IS) besieged the city of Kobanî in the autumn of 2014. The Women’s Protection Units (YPJ), all-female militias, played a major role in the brutally hard-fought but ultimately successful defence of the city. This represented a turning of the tide against IS’s relentless advance across northern Syria. At Kobanî an army of revolutionary women and their allies decisively defeated and humiliated the once seemingly invincible armies of the IS. As I write, the Syrian Democratic Forces (SDF), a multi-ethnic coalition commanded by Rojda Felat, a Kurdish woman, is rapidly closing in on Raqqa, IS’s de facto capital. While defeating IS is an immediate concern and necessity, it is not the only concern or challenge facing people in Rojava. Jihadist factions besides IS, military incursions by the Turkish state, the unpredictable Assad regime, the closing of both the Turkish and Iraqi borders and limiting of crucial supply lines, remain major challenges for Rojava’s democratic project. Nevertheless, many of Rojava’s Kurds believe the best chance for an enduring peace in Syria and beyond lies in the positive promise of the democratic confederal model. We arrived in Strasbourg in the late afternoon, making our way to the local Kurdish community centre where we were met with cheers and enthusiastic greetings. After a warm meal we headed to a local Kurdish language television studio to participate in an on-air interview. Several of us spoke on camera and answered questions about the march. Afterwards we split into small three- or four-person groups and were placed with host families for the night. The next day we attended a 15,000 strong rally near Strasbourg’s Stade de la Meinau. Alternating between Kurdish and French the crowd chanted “Jin, Jiyan, Azadi” (Kurdish for “Women, Life, Freedom!”), “Liberté pour Öcalan”, “Abolir l’État fasciste Turc”, and “Solution politique de la question Kurde!”. The international participants in the march were led onto a large stage set up for the rally. Looking out from the stage a field of flags in the bright red, green, and yellow of Kurdistan fluttered like giant butterflies above the crowd, contrasting against the grey February sky. One of our members read a prepared speech emphasising the march’s main aims: international solidarity with the Kurdish Freedom Movement; a political solution to the ongoing Turkish/Kurdish conflict; and freedom for Öcalan. The atmosphere at the rally, though celebratory, carried a sense of urgency, given the deteriorating conditions for Kurds in Turkey. In late 2014 the Revolutionary Patriotic Youth Movement (Y-DGH) in the city of Cizîr (Cizre in Turkish) initiated an uprising. They called for Turkey to open the border and allow food, medicine, and armed fighters into Rojava to break Islamic States’ siege of Kobanî. Turkey’s response was harsh and disproportionate. Over the last three years a series of military raids, round-the-clock curfews, and the bombardment and near levelling of majority Kurdish cities in the country’s southeast has amounted to a campaign of brutal collective punishment putting roughly 200,000 people at risk (Amnesty International 2016). A recent report issued by the Office of the United Nations High Commissioner for Human Rights (OHCHR 2017) documents 2,000 conflict-related deaths between 2015 and 2016, the majority of dead being Kurdish residents of the besieged cities. It also estimates the number of internally displaced people to be between 355,000 and 500,000. In addition to many cases of enforced disappearances and torture and destruction of homes, the OHCHR also notes the Turkish state engaged in the destruction of “cultural heritage; incitement to hatred; prevention of access to emergency care, food, water and livelihood; violence against women; and severe curtailment of the rights to freedom of opinion and expression as well as the right to participate in public life”. In the aftermath of the failed military coup in July 2016 the situation in Turkey has deteriorated even further. A wider crackdown on civil society by the ruling AK Party, led by President Recep Tayyip Erdoğan, has affected Kurds disproportionately. Over 100 news media outlets were closed and 42 journalists were imprisoned on politically motivated charges, leading Reporters Without Borders (2016) to declare Turkey a “world leader in imprisoned journalists”. The People’s Democratic Party (HDP), a party representing Kurdish and other minority groups, has come under harsh political repression as well. In November 2016, over a dozen HDP MPs were arrested on spurious charges. These include the HDP’s co-leaders Figen Yuksekdag and Selahattin Demirtas–the latter sometimes called the “Kurdish Obama” for his good looks and political charisma. Both face decades behind bars. 28 Kurdish municipalities have been put under state trusteeship, their democratically elected mayors removed or imprisoned. Under these conditions, Kurdish supporters fear for Öcalan’s safety, especially since access to him, even by his legal team, has been severally limited and seemingly arbitrary in recent years. As I sat around my host’s kitchen table the night before the rally he said to me: “democratic confederalism isn’t just for Kurds, it’s for everyone.” This sentiment was also expressed by one of the march’s key organizers. I know many of the friends whom I had the honour to march beside on the Long March for Kurdistan and Öcalan would agree. As our old political institutions continue to fail us, it is far past time to develop new models of socio-political organisation and I believe Rojava’s Kurds and their allies are pointing the way forward. The hand sign: touching the tips of one’s middle and ring fingers to one’s thumb while rising one’s index finger and pinky. The Grey Wolves are a Turkish neo-fascist organization with a network of activists spread across Europe. Since their founding in the late 1960s in Turkey they have been associated with hundreds of murders, including 1978’s Maras massacre where over 100 Alevis, a religious minority, were slaughtered (see http://www.middleeasteye.net/news/analysis-growing-strength-turkeys-ultra-nationalists-559935572). 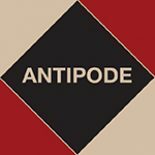 This entry was posted on 12 April 2017 by Antipode Editorial Office in Interventions and tagged Öcalan, Bookchin, democracy, democratic confederalism, fascism, international solidarity, Islamic State, Kobanî, Kurdish freedom movement, Kurdish state, Kurdistan, libertarian municipalism, nationalism, People’s Democratic Party, PKK, Rojava, self-determination, social ecology, solidarity, solidarity activism, solidarity movements, Syria, Syrian Democratic Forces, the state, Turkey, Women’s Protection Units.